Gerald FitzGerald was born in 1487 in Maynooth, County Kildare; he was the son of Gerald FitzGerald, 8th Earl of Kildare and his wife Alison FitzEustace. FitzGerald’s father was the Lord Deputy of Ireland during the reign of King Edward IV and remained in the position after Henry Tudor won the Battle of Bosworth and took the throne, however, FitzGerald Snr disobeyed the Tudor King on several occasions most notably by supporting the pretender to the throne Lambert Simnel. In 1502 the younger FitzGerald played a principle role in the funeral of Prince Arthur Tudor who had died at Ludlow Castle and was buried at Worcester Cathedral. 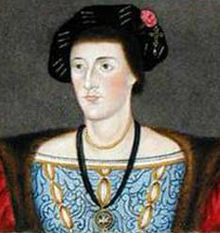 In 1503 FitzGerald had already married Elizabeth Zouche, cousin to King Henry VII and he was given permission to return to Ireland with his father. The following year, in 1504, he was appointed to Lord High Treasurer of Ireland, in August of that year FitzGerald commanded the reserve at the Battle of Knockdoe where his inexperience and impulsive nature caused them a loss. FitzGerald’s father died in 1513 and FitzGerald became the 9th Earl of Kildare and at the same time selected to be the Lord Justice of Ireland. FitzGerald’s brother in law King Henry VIII also promoted him to his late father’s position of Lord Deputy. FitzGerald defended Ireland and he did such a great job in 1513, after having defeated O’More and killing O’Reilly, a rebel, King Henry VIII granted FitzGerald the custom of the ports in the County of Down. In 1515 FitzGerald invaded Imayle in the Wicklow Mountains and killed Shane O’Toole, whose head he sent to the Lord Mayor of Dublin. FitzGerald went on to march into Ely O’Carroll where he, along with the Earl of Ormond and the son of the Earl of Desmond, captured Lemyvannan castle. In March 1517 FitzGerald called a parliament in Dublin from which he went and invaded Ulster, stormed Dundrum Castle then marched toward Tyrone before taking the Castle of Dungannon. In 1518 he was accused of maladministration in order to clear his name he appointed a deputy in his place and he set sail for England. Upon arrival he was removed from the government and in his place Thomas Howard, 2nd Duke of Norfolk was appointed as his replacement. FitzGerald remained in England and in 1520 he is recorded as being present with King Henry VIII at the Field of the Cloth of Gold. It was at the Field of the Cloth of Gold that FitzGerald met the King’s first cousin, Lady Elizabeth Grey, a few months later they married. His time in Ireland was far from over though in 1523 King Henry permitted him to return after rumours came out of the country that he was attempting to stir up trouble for the new Lord Deputy, following inquires the King decided that there was no evidence to convict FitzGerald. At the same time he founded the College of Maynooth. Upon his arrival back in Ireland FitzGerald instantly set off on an expedition to Leix but they ran into difficulty and soon retreated to Dublin. FitzGerald and the Earl of Kildare and Ormond, the current Lord Deputy, argued and accused each other of treason therefore the only thing they could do was to appeal to the King to settle it. Henry VIII ordered the two that they should abstain from making war without his permission, that they should cease levying coigne and livery within the four shires of Meath, Urgell, Dublin and Kildare. The pair were also ordered that their kinsmen submitted to the law and finally that they were bound by a bond of 1,000 marks to keep the peace for one year. The peace between the two men did not last for long, James Talbot one of the Earl of Ormond’s followers was murdered by the retainers of FitzGerald. Again an appeal was sent to the King who sent commissioners to Ireland. An inquiry was held at Christ Church, Dublin in June 1524, the inquiry found in favour of FitzGerald and an indenture was drawn up ordering the two to forgive each other and become friends. Soon after the inquiry FitzGerald was reappointed as Lord Deputy and took the oath of the position at St Thomas Court with his nephew Con Bacagh O’Neill carrying the sword of state walking before him. He agreed that he would not grant any pardons without the consent of the council in England. He was also required that his men dressed in the English fashion and shaved their upper beards. In 1525 FitzGerald and Ormond was once again fighting over the amount of £800 as before they were accusing each other. At the same time Ormond was required by royal mandate to assemble an army to march and arrest the Earl of Desmond before moving north to make peace with the O’Neills and O’Donnells. In 1526 FitzGerald was summoned to England to face the charges that Ormond had accused him of. Ormond now held the title of Earl of Ossory and accused FitzGerald of secretly assisting the Desmonds and murdered many subjects in Ireland due to their association with the Ormond and Butler family. When FitzGerald arrived in London he was sent to the Tower of London and was kept in England for four years when he was eventually brought in front of a council where a violent altercation broke out between himself and Cardinal Wolsey. Holinshed reported that Wolsey obtained an order for FitzGerald’s execution but instead he was granted bail and in 1530 he was one of the peers who signed the letter to the Pope regarding the King’s divorce with Katherine of Aragon. In 1530 after signing the letter to the Pope FitzGerald was once again permitted to return to Ireland with Skeffington, the new Lord Deputy. After a march again the O’Tooles and then against the O’Donnells FitzGerald and Ormond were once again writing to the King to accuse each other. With the Deputy supported by the Butlers, FitzGerald was able to clear himself and was appointed to succeed Skeffington as Lord Deputy under the Duke of Richmond who had been granted the office of the Lord Lieutenant of Ireland. FitzGerald landed back in Ireland to great acclaim however, it did not last and it was eventually realised that peace in Ireland could never be achieved if FitzGerald or Ormond held the office of the Lord Deputy. FitzGerald received a gunshot wound during a battle with the O’Carrolls at Birr and as a result partially lost the use of his limbs and speech. In February 1534 FitzGerald was once again summoned to court at Drogheda where he nominated his son, Thomas, as Vice Deputy before he set off to England. Upon arriving in England he was again sent to the Tower of London, where on the 2nd September 1534 he died, with the official cause being from grief after hearing of his son’s rebellion. He is buried in the Chapel of St Peter ad Vincula within the grounds of the Tower of London.